"The building at the right of the picture, built in 1875 by Joseph Connell and Thomas Curley, was actually two separate but adjoining buildings, one owned by Asa Boothby, the other owned by the estate of Thomas Curley. In 1903, William T. Curley and his brother, Leo purchased the building, known as the Connell-Curley Block for $9,000. The block, on of the town's largest, was torn down in 1939 to make room for a 'modern' one-story building which was completed in 1940. The occupants at that time were Smith's Drug Store, Cubby Hole Gift Shop and Crystal Fruit Exchange. The buildings to the left were also replaced in the early 1940s by a modern, brick building which housed the Atlantic and Pacific chain store, Russell's Electric Shop, Friends Bakery, and Nagle's Drug Store." -- Text from calendar by Jayne M. D'Onofrio. 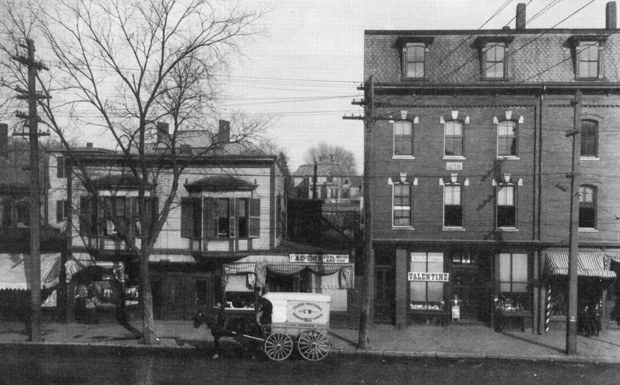 “Downtown Wakefield, Main Street, circa 1890s,” NOBLE Digital Heritage, accessed April 22, 2019, https://digitalheritage.noblenet.org/noble/items/show/6922.